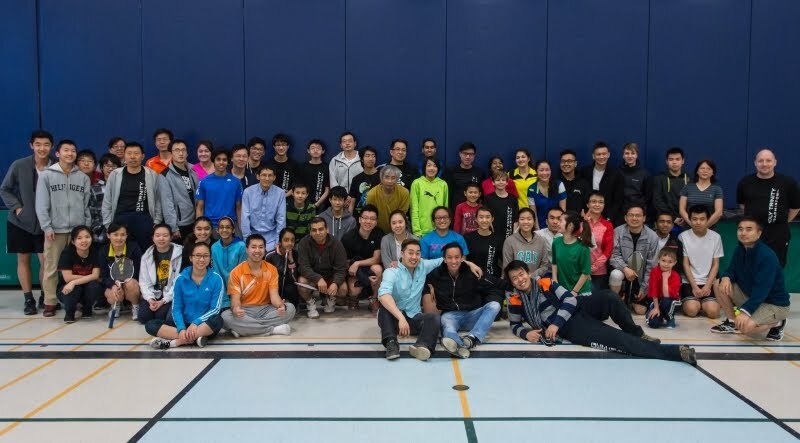 The Holy Trinity Badminton Club (HTBC) offers badminton programs to the Ottawa, Kanata, and Stittsville residents, for recreational and competitive players. There are 2 programs: The Basic Membership (Sunday 10am to 3pm), and Corey's Coaching Classes (Sunday 10am, 11am, 12pm, and 1pm). The Basic Membership is $200 for ~29 Sundays and 5 hours per Sunday. Plastic Yellow Yonex Mavis 300 Medium Speed Shuttles are provided and the system relies on a tag system for fair play, fair court time, and easy to understand for all. There are 6 courts with court rotations announced every 15 minutes. Adults and juniors can join this membership - making it possible for parents to play with their children. Friends can play with one another by clipping their tags together. The recreational and social players are recommended joining the Basic Membership. This club does not cater to the highly competitive or elite. A $50 discount is available for children and students. Consider joining Corey's Coaching Classes (CCC + Basic) at $300 for ~29 classes - running from Sept 10th to June 3rd. Corey offers 5 classes (1 hour each): Age Group One (grades 4, 5, 6 @ 10am), Age Group Two (grades 7, 8, and 9 @ 11am), Age Group Three (grades 10, 11, 12 @ 12pm), Advanced (all ages @ 10am), and Adult-Intermediate (19+ @ 1pm). Coaching classes are highly recommended for players looking for rapid improvement, correcting bad habits, learning proper techniques, and developing great footwork. A $50 discount is available for children and students. Private lessons are available @ 2pm. Please inquire with Eugene for more details. Private lessons are booked per Sunday. Hourly rates vary from coach to coach. If you're ready to register, please fill out the Online Registration form, and wait for a confirmation email (up to 24 hours). If you have any questions, please don't hesitate to contact us at HolyTrinity@odba.ca. We look forward to seeing you on the badminton courts, September 10th - the first club meet. Eugene Lee, Mike Tran, Vu Dao, and Corey Hum. From 2009 to 2012, the ODBA have been running a program called the Sunday Drop-in Program, funded by the Ontario Trillium Foundation. With the funding depleted, the program has ended. Since there were no other parties interested in converting the Sunday Drop-in Program into a club, Eugene and Mike stepped up to make it happen. Eugene and Mike are ODBA Board of Directors - an umbrella, non-profit organization, composed of nearly every badminton club in the Greater Ottawa Area. It was clear that there has been a great demand for Ottawa badminton, and not enough available clubs. For the purpose of continuing to serve the Kanata area more badminton, the Holy Trinity Badminton Club was born. The Holy Trinity Badminton Club is affiliated with the Ottawa District Badminton Association (ODBA). The ODBA serves the badminton community in the areas of policy-making, training, rules & regulations, district tournaments, ranking points, and so much more. The ODBA caters to every age category: juniors, adults, and masters. By joining the Holy Trinity Badminton Club, a portion of your membership fee will go towards an automatic membership with the ODBA. Hence, all members of the Holy Trinity Badminton Club are members of the ODBA.